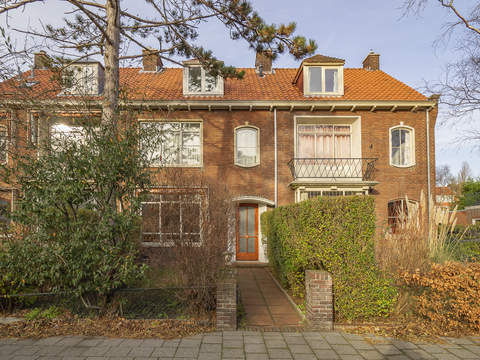 Buijs Ballotstraat 17 Price asked € 595.000 k.k. Former apartment with garage converted into an exclusive house with 2 bathrooms, 4/5 bedrooms and well landscaped back garden. Located near shops on the Fahrenheitstraat and Weimarstraat, public transport and within cycling distance of the Hague city center. As well as dining and drinking around the corner such as café Franklin and café Madeleine. Entrance, vestibule with original ceiling, draft separation with skylights which are equipped with stained glass, hallway, cupboard under the staircase, spacious toilet with original handbasin. French doors with panes to the living / dining room (former garage) approx. 11.85 x 3.16 with new front and back facade doors consisting of a lot of glass and panes. Open modern kitchen approx. 4.00 x 1.78 with wooden worktop, oven, separate microwave, fridge and freezer, dishwasher and 5-burner gas stove (all from Siemens). French doors to the back garden approx. 7.68 x 5.48 facing northwest with wooden shed with electricity. Landing, spacious bathroom approx. 4.54 x 1.78 with toilet, shower, bathroom furniture and bath, back bedroom approx. 4.03 x 3.19 with conservatory approx. 1.98 x 3.19 and marble fireplace, bright and spacious bedroom approx. 5.08 x 3.97 with bay window, skylights with stained glass, marble fireplace and "walk-in closet". Landing with skylight, built-in cupboard with position of the central heating system and storage space. Electricity 12 groups with circuit breaker. The house has at the front aluminium window frames with double glazing and wooden window frames with single glazing and at the back wooden window frames with partly double glazing. Rear of the house needs to be painted. Living surface approx. 173 m². The volume of the house is approx. 664 m³. Close to shops at the Fahrenheitstraat, Weimarstraat and within cycling distance of the center of The Hague, sports facilities, ‘Bosjes van Poot’, ‘Bosjes van Pex’ and dunes, beach and sea !! Public transport (RandstadRail Line 3, tram 12), main roads through Hubertustunnel and Westland Road. Near International School of The Hague, European School of The Hague, schools and various sports facilities.